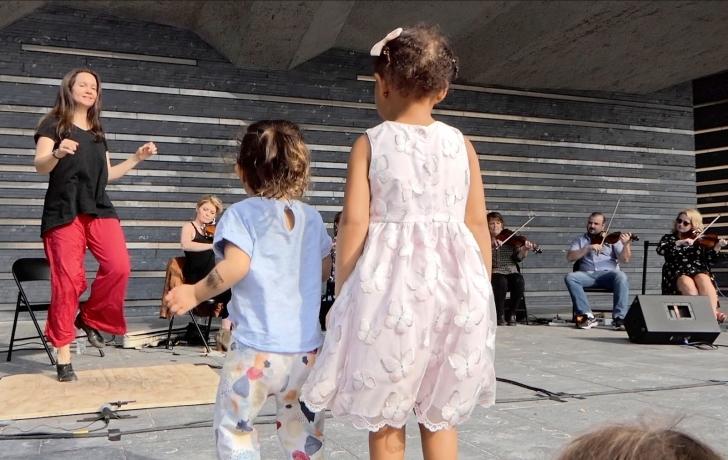 Seven fiddlers and a step dancer turned the Irish Hunger Memorial Plaza into the toe-tapping setting for traditional Irish dance music on June 7. Jigs, reels, hornpipes, a couple of polkas and a march filled the late afternoon air and got children on their feet and jumping to what fiddler/emcee and New York Trad Fest creator Tony DeMarco called the “meat and potatoes of the traditional repertoire.” Step dancer Megan Downes accompanied the tunes with her percussive footwork. Also on fiddle were Vonnie Quinn, Pat Mangan, Bernie Fee, Eileen Ivers, Matt Mancuso and Maeve Flanagan. More fiddling, sponsored by Battery Park City Parks, is coming to the plaza with Brian Conway, a champion of the instrument, on June 14, and the Dalarnas Fiddle Association on June 21. The group features the traditional music of Dalarna, a region of Sweden. For more information on a summer of music coming to Battery Park City’s parks, scroll here.